MOVEMENT Automatic mechanical, Panerai P.9100/R calibre, executed entirely by Panerai, 13? lignes, 9.55 mm thick, 37 jewels, Glucydur® balance, 28,800 alternations/hour. KIF Parechoc® anti-shock device. Power reserve 3 days, two barrels. 328 components. FUNCTIONS Hours, minutes, small seconds, flyback chronograph, regatta countdown, knots scale for calculation of boat speed, seconds reset. CASE Diameter 47 mm, brushed titanium. Engraved brushed titanium buttons for the chronograph functions at 10 o’clock and 8 o’clock. Brushed button and orange surface for the regatta function at 4 o’clock. BEZEL Polished titanium. BACK See-through sapphire crystal. DEVICE PROTECTING THE CROWN (protected as trademark) Brushed titanium. DIAL Black with luminous Arabic numerals and hour markers. Chronograph hour counter at 3 o' clock, seconds at 9 o’clock, central chronograph seconds and minutes hands. CRYSTAL Sapphire, made of corundum, 1.6 mm thick. Anti-reflective coating. WATER-RESISTANCE 10 bar (~ 100 metres). STRAP PANERAI personalised rubber strap and trapezoidal brushed titanium buckle. Supplied with a second interchangeable strap, a tool for changing the strap and a steel screwdriver. 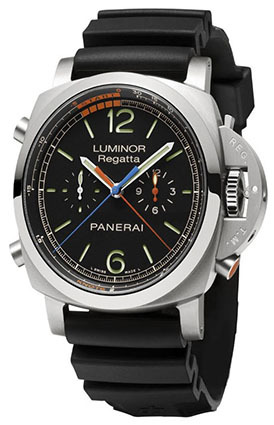 Есть вопросы по Officine Panerai Luminor 1950 Regatta 3 Days Chrono Flyback Automatic Titanio PAM00526?